The weather may not always be the best, but a holiday in Seattle is just as good indoors as out, with a host of activities on the menu all year round, from ballet to boating. This watery city points its landmark Space Needle at the stars, but is firmly anchored in its lakeland setting which provides plenty of waterfront attractions to complement its trendy high-rise profile. When in Seattle visitors should be sure to explore the foodie scene. The city is home to some fine restaurants offering wonderful sea views and cuisine both traditional and eclectic. For those who want to extend their evenings into the early mornings, there is some brilliant nightlife too. Outdoorsy sophisticates with a taste for the good things in life will enjoy soaking up the atmosphere of this gleaming city on a holiday in Seattle. When you travel to Seattle you are just as likely to get your head wet as your feet, for not only is the city surrounded by water but plenty falls from the sky too. The driest months, and thus the best time to holiday in Seattle, are between June and August, when temperatures are also the most congenial. A trip to Seattle though, whatever the weather, is generally a much enjoyed one. Read more on Seattle's Climate and Weather. -Admire the 'Hammering Man' that stands outside the Seattle Art Museum. -Visit the historic district of Pioneer Square and explore more than 30 galleries. 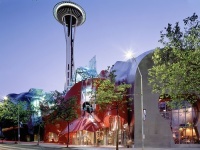 -See the Seattle Space Needle, an internationally recognised symbol. -Feast your eyes on the many exhibits at the Experience Music Project. -Catch a sightseeing ferry trip (or three! ), a must when in Seattle. -Sample local and organic treats at the Pike Place Farmer's Market. -Take a trip to the Seattle Aquarium where adults and children alike can enjoy the extensive marine displays. -See more than 130 aircraft at the Museum of Flight and learn all there is to know about aviation. Catch a ferry to one of the wonderful islands in scenic Puget Sound, the most popular being Bainbridge which has its own winery and is only 10 miles (16km) west of Seattle. Another great way to spend a day is to venture to the northwest coast to enjoy the San Juan Islands and the Canadian Gulf islands, which form one of the best boater paradises in the world. Tacoma International Airport, more commonly known as Sea-Tac Airport, is just 12 miles (19km) south of Seattle and is one of the busiest in the US. This is where travellers land when visiting Seattle. Get more information on this airport here. -Seattle is the most literate city in the US; home to the most bookstores and libraries per capita. -Seattle has the second most glassblowing studios in the world, the place with the most being Murano, an island near Venice, Italy. -Despite its reputation for being a rainy and wet city, Seattle actually receives less annual rainfall than both New York and Chicago. Seattle is known as the 'Emerald City', and just like the home of the Wizard of Oz in the fairy tale, it is a magical place. Rated as one of the world's most liveable cities, it boasts among its citizens three out of the world's ten richest men, including Bill Gates, head of the mighty Microsoft Empire. The city's emergence as a trend-setting and fashionable metropolis with sky-high property prices has occurred in less than 200 years, since it was founded in 1869. Sitting at the extremity of the United States' northwest, at the gateway to Canada, Seattle reaches for the sky with its landmark soaring 'space needle'. Built in the 1960s, this modern monument epitomises the city's image as a high-tech, dynamic, and young community. Seattle sits on the shores of two large lakes and Puget Sound, with remote wilderness less than an hour away, and it is flanked by two major mountain ranges (Olympics and Cascades), with Mount Rainier in full view from the city. It is also within easy reach of the San Juan Islands, Pacific Ocean beaches, and major rivers. Visitors and locals alike revel in the outdoor activities the city's situation provides for.